Sorry for such a late in the day post. Life got right in the way of my daily project update. But all seems settled down now. So here is a card for today. 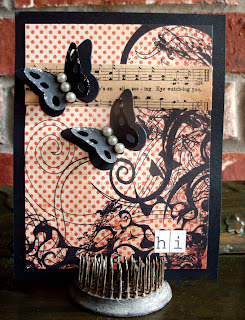 The idea from the card came from this weeks sketch at MFT Stamps. You can play too. Just go to the website and see how to enter. You can win $20 in MFT money. Score! I think this was the simplest card I've ever done. I used the butterfly die from MFT Stamps, added a bit of paper and a sentiment and called it done. The only fancy things I added were the pearls and a very light dusting of Stickles on the butterfly wings. SUPER EASY! So here is the sketch. Why don't you enter too? Hope I'll see you tomorrow.